Richard Lowe-Lauri looks at the decline of bull running in the English town of Stamford. Accounting for bull running’s decline is relatively straightforward. Yet understanding why reformists – in particular Richard Newcomb, a wealthy local magistrate and the proprietor of the Stamford Mercury, and the RSPCA – were so keen to smother Stamford’s ‘chartered amusement’, is much more difficult to discern. We boast of a religion which teaches compassion to brutes, ‘A merciful man is merciful to his beast’: and how rational beings dare to seek amusement in enraging and tormenting the creatures of God, noble animals given for valuable purposes, and driving them to fury and to madness, is most lamentable and astonishing! Though God has not in so many express words said ‘thou shalt not bait, thou shalt not worry, thou shalt not torture,’ he has conveyed to us many indirect admonitions respecting that interesting branch of our duty, a due regard to the comfort of his dumb creatures. For those who opposed bull running, then, animal suffering was morally wrong and required eliminating. Accordingly the bull was nearly always depicted as virtuous and blameless. The Stamford Mercury and the records of the RSPCA most often referred to him as the ‘noble animal’, the ‘poor distressed animal’ or the ‘poor innocent bull’. He was also described as being of a ‘meek and quiet disposition’, requiring infuriating by all manner of evil deeds, often described in the most distressing detail. In 1819, for instance, the Stamford Mercury commented on the way the bullards allegedly tore pieces out of the animal’s flesh while it was still alive; and in 1835 one RSPCA inspector reported how dogs nearly tore off the bull’s testicles. The accuracy of these reports is questionable; one local newspaper thought it a gross deception to label the sport ‘cruel’, for at the bull running of 1837 the animal survived completely unharmed. But that they occupy the writings of reformists at all is revealing. A concern for the alleged cruelty of the bull running for the animal’s sake, therefore, was certainly a factor driving contemporaries’ efforts to suppress the practice. The practice is, as may be imagined, fraught with mischief: it is the production of much disorder amongst the lower class of inhabitants both of the town and neighbourhood, and tends to demoralisation: it also cannot be denied that the ‘sport’ as it is miscalled, necessarily inflicts cruelty on the animal. If the hierarchy of points listed here reflects the relative importance contemporaries attached to them, then their concern for the bull’s suffering was trivial compared to other anxieties, namely the sport’s riotous nature and alleged ‘demoralising’ influence. Ultimately, the notion that an increasing sensitivity towards animal suffering lay at the heart of opposition to bull running is unconvincing. The greatest concern of reformists lay with the human participants and spectators. This encompassed two themes: the sport’s so-called ‘brutalising’ influence; and its alleged riotous and disorderly character. The few stupid, brutal amateurs, whose hearts have not outgrown such an amusement must not be permitted to outrage humanity in the name of a people who … are incapable of taking pleasure in the contemplation of excruciating torments. Such sights must harden the heart, but cannot embolden the spirit. They degrade the soul, without offering any compensation for the mischief which they entail upon. They are calculated to make murderers not heroes. Sufficiently obvious what a pernicious and demoralizing influence the Bull-running … must have on the habits of society: where such practices are observed and sanctioned, it would be absurd and visionary to expect a high state of moral cultivation; the reverse is evident to every reflecting mind. Consequently, there was nothing controversial about associating the pastime with a range of evils besides animal cruelty, including vice, licentiousness and drunkenness. The RSPCA mirrored local anxieties. In the reports concerning the bull running of 1835 from Henry Thomas, the society’s secretary, and Mr Oakley, a former police inspector, emphasis was placed on the hard-hearted bullards, tellingly described as the ‘unfeeling multitude’. Their torturous deeds were said to have ‘afforded great delight to those engaged‘. Oakley ended his report by stating: ‘A more disgusting scene, one more tending to brutalise the feelings and demoralise human nature I never witnessed.’ Unsurprisingly, fears that this moral degradation would affect succeeding generations were articulated regularly. At the annual meeting of the society in 1837, for instance, those present were asked to contemplate ‘what must be the feelings of these men, on returning to their homes as husbands and fathers, and … what an example they must afford to the dawning intellect that might perchance be looking up to them’. Consequently, those who opposed the bull-running were concerned less with animal cruelty per se than its alleged ‘brutalising’ and ‘demoralising’ influence on participants and spectators. Second, reformists furnished a rising obsession with the bull-running’s purportedly riotous character, which was usually connected to deep-felt anxieties about the lower classes and the maintenance of the social order. Historian Harriet Ritvo, for example, has argued from the society’s annual reports that ‘the RSPCA’s concern with animal baiting and fighting had at least as much to do with human discipline as with animal pain’. Notably, the report of 1836 relating to the Stamford bull running of November 1835 offers only a cursory reference to the bull. By contrast, the human participants and spectators were depicted in colourful detail. There was reportedly ‘a large assemblage of between 200 and 300 persons of the lowest description’, who in running the bull throughout the town were said to have ‘halted in front of various houses, particularly those of the inhabitants who were known to be adverse to such cruelties … where loud yells … were set up by the mob’. In this instance the unruly actions of the lower classes were of far greater concern to the society than any notion of animal suffering. Analysis of a much broader range of evidence confirms Ritvo’s argument. The RSPCA’s minute books, for instance, often depicted the bull running and its participants in disobedient and rebellious terms. In those passages relating to the bull running of November 1837 the bullards, described as a ‘mob’ and a ‘disorderly assemblage’ and consisting of the ‘lowest vagabonds’, were reportedly a dangerous threat to the peaceably disposed inhabitants of the town. Stopping temporarily in front of the town hall where the magistrates were sitting, it was said: ‘The mob shouted, yelled and groaned several times in defiance and used all sorts of opprobrious terms – a greater scene of riot, confusion and danger has seldom been witnessed’. Not all bullards belonged to the lower orders and the society often conveyed disbelief that more ‘respectable’ persons could be found among the crowd. Nonetheless, it still treated the bull running as a predominantly working-class amusement and, therefore, a threat to law and order. The press displayed an equal concern for the custom’s riotous nature and the unruly character of those involved. Bullards were often referred to by phrases such as ‘heartless ruffians’ or ‘violent and outrageous rabble’, while November 13th itself was condemned as an ‘annual uproar’ and the cause of ‘riot, confusion, plunder and bloodshed’. Likewise, in the later 1830s, warnings from the town magistrates against attempts to keep up the annual amusement were concerned chiefly with the threat posed to law and order. Before the bull running of 1837 the civic elite advised the town’s inhabitants that ‘any person or persons attempting to introduce or practice Bull-running in Stamford … or to do any other act amounting to a breach of the peace on the 13th instant, will be prosecuted for the same with the utmost rigour of the law’, and in 1839 they purported to ‘earnestly invite the peaceably-disposed inhabitants to aid and assist them in preserving the peace, in preventing mischief, and in apprehending offenders’. Fears of disorder were undoubtedly justified. Bull running was incredibly dangerous. Reports of injuries, and sometimes fatalities, at the hands of the rampaging animal were not uncommon; in 1837 an application was made by a woman to the town workhouse after her husband had been hurt by the bull and whose family were consequently unable to support themselves. 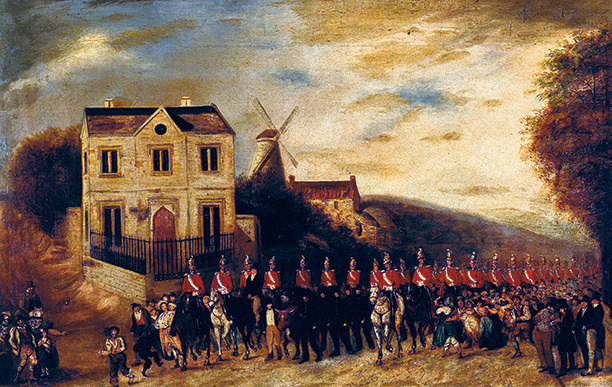 The violent nature of the bullards’ resistance in 1838 to the attempt made to suppress the practice, when a crowd numbering 2,000 pelted the Metropolitan Police and military dragoons with stones, is testimony to bull running’s riotous potential. Ultimately, those hostile to bull running were driven, principally, by a rising concern with the sport’s human participants and spectators. This concern embraced anxieties about, firstly, the bull-running’s alleged ‘brutalising’ and ‘demoralising’ influence and, secondly, its riotous and tumultuous character. Richard Lowe-Lauri is winner of the 2012 History Today Undergraduate Dissertation of the Year Award administered by the Royal Historical Society. Directly submitted entries will not be considered.